In the previous blog posts in this series you've learned how to use Gson to convert Java objects to JSON and vice versa. So far, we've shown you how to set up models and what's important in order to get the correct mapping going. With this blog post we'll start a new multi-post part of this series which will use the GsonBuilder to customize several pieces of Gson's behavior. In all the previously published blog posts we've written that you can just get an instance of Gson with Gson gson = new Gson();. This is totally valid when you need Gson with its standard configurations. However, Gson has a lot of little settings you can change. This is quite convenient if you need to utilize Gson in a way which is slightly non-standard. In order to change certain settings you can use the GsonBuilder to create a new Gson instance with your customized configuration. The GsonBuilder class offers a .create() method which returns a Gson instance. With the Gson instance you can do everything we've shown you before: map all kinds of data from and to JSON. The first GsonBuilder option we want to show you are naming policies. We've always assumed that your Java model files and the JSON payload for request and responses of the API apply the same naming schema. We've shown you how to use @SerializedName to change the serialization of a single model property. However, if your API and your Java models are not agreeing on naming it can be tedious to change hundreds of property names with the @SerializedName annotation. All conversions using the above Gson instance will now apply the field naming policy FieldNamingPolicy.IDENTITY. In the next few sections we'll explore what exactly that means and how the predefined field naming policies behave. Let's start with the easiest one: IDENTITY. As you can see, none of the field names changed. It copied the exact names from the model. If you're not setting a policy or don't use the GsonBuilder and directly instantiate a Gson with new Gson() it'll use this policy. The isDeveloper and _ageOfDeveloper got split up with _. Note that the leading _ of _ageOfDeveloper is still there! If you don't want to use underscores and instead prefer dashes, the next section might be something for you. Please note how it still only changed the two properties with upper case letters in them. The leading underscore of _ageOfDeveloper or the underscores of email_of_developer are not affected! If you need a more strict policy, you can implement your own logic, which we'll show you in a minute. But before moving to custom policies, it's time for the last two predefined ones. As you can see, not much changed from UPPER_CAMEL_CASE. The only difference is that the two fields, which already had upper case letters, received spaces in between the words. The emailOfDeveloper stayed exactly as in the @SerializedName annotation and did not get a leading upper case letter. The provided policies in combination with the @SerializedName might not be enough to cover your use case. You can implement your own version of the FieldNamingPolicy. Since you can only pass pre-defined enum values to the .setFieldNamingPolicy() method, Gson offers a second method .setFieldNamingStrategy(). Gson only accepts one strategy. Thus, you've to implement your logic in a single FieldNamingStrategy implementation. If you call one of the methods we've shown you above more than once, it'll replace the previous one. In this blog post we've only looked at the serialization side of things. 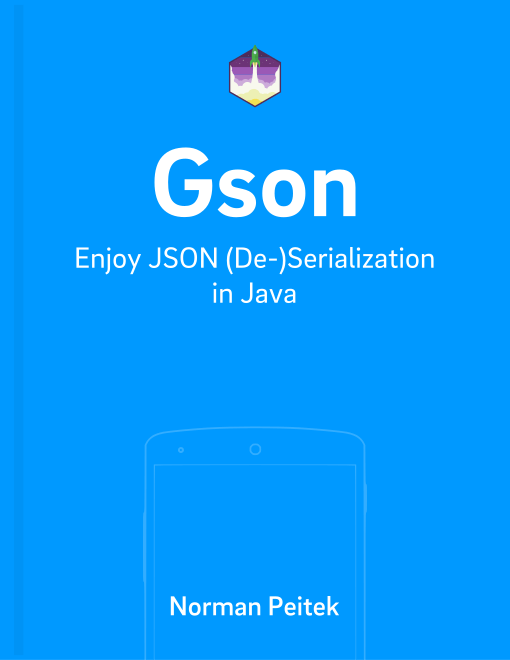 In other words how does the JSON look like after we've used Gson to convert the data from Java objects. All of these naming policies have the same effect during deserialization. Basically, if you've an API which returns all values in lower case with underscores as separation between words you could use the LOWER_CASE_WITH_UNDERSCORES as policy and use regular Java naming conventions in your model. If you apply the correct naming strategy, Gson will do the mapping even though the names are different. In this blog post, you've learned the basics of using the GsonBuilder. We looked at a first option to customize Gson's behavior. In particular, we've shown you a variety of policies to customize property naming during the (de)serialization of Java objects. In the next blog post, we'll continue to show you more GsonBuilder capabilities. Specifically, we'll introduce a way to force Gson to serialize null values.